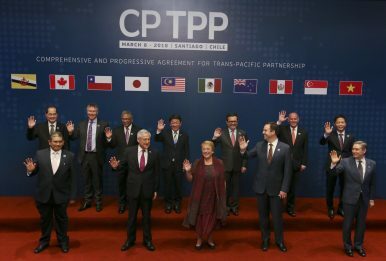 Ministers from the TPP-11 countries pose for an official photo prior the signing ceremony of the Comprehensive and Progressive Agreement for Trans-Pacific Partnership in Santiago, Chile (March 8, 2018). Faced with the decline of American hegemony, what are the United States’ trade and security partners in the Asia-Pacific doing to protect their respective national interests? To answer this question, we look closely at Australia, Japan, and Vietnam. Each of these was a signatory to the Trans-Pacific Partnership (TPP) trade agreement, from which the United States withdrew in 2017. They have all subsequently gone on to sign the successor to TPP, the Comprehensive Trade Partnership Agreement (CPTPP), also known as TPP-11. While each has its unique political and economic history, the three countries share security and economic concerns, as well as reasons to be worried by the inconsistencies in American foreign policy. Motivated by rational self-interest, each country is proactively taking steps to protect its own position in the regional and international system. Following World War II, the United States led the creation of what has come to be known as the liberal international order. This global order was designed not only to prevent the type of mass conflict that consumed the first half of the 20th century, but also to provide the security and stability necessary to allow member countries to thrive economically. For countries that signed up for the global order, this alliance paid off handsomely, facilitating robust economic growth and collective security arrangements. Perhaps no country benefited more from this arrangement than the United States itself. Washington drew more and more countries into its orbit, supported their conversion to democratic governance, and profited from increased economic trade. In recent decades, however, an overcommitted military, domestic fiscal insolvency, the rise of new powers and actors, and intense domestic political polarization have all contributed to the erosion of America’s relative power. The United States still provides a valuable security umbrella to existing allies, such as Australia and Japan. For non-allies like Vietnam, the United States represents a valuable counterbalance to China. However, over the last two decades, Washington has signaled that is no longer committed to being a consistent partner. In response, countries are taking up bilateral and multilateral initiatives that protect their interests and balance the rivalry between the United States and China. During the Obama administration’s tenure, Australia welcomed the U.S. Asia “pivot” or “rebalance.” However, the United States’ unilateral withdrawal from the TPP under current President Donald Trump sent a signal that Washington was no longer able and willing to make credible commitments to the Asia-Pacific. Speaking only hours after the United States announced its withdrawal, Australian Trade Minister Steven Ciobo stated, “The Turnbull government does not shy away from standing up for what is in our national interest – continuing our strong advocacy on the benefits for the TPP deal is no different. I have been speaking with my TPP counterparts on ways to lock in the benefits from the TPP, without the United States if need be.” These are certainly harsh words from the United States’ closest ally. The U.S. withdrawal from the TPP also reinvigorated discussions and negotiations on the Regional Comprehensive Economic Partnership (RCEP), a 16-nation economic agreement. The agreement provides Australia with greater access to both India and China and covers in total over 60 percent of Australia’s bilateral trade, a greater percentage than even the original TPP. Australia’s willingness to build significant economic relationships independent of the United States may impact other foreign policy and security issues, particularly Australia’s willingness to stand up to Chinese aggression. In other words, Australia will be loath to jeopardize its relationship with China, even if the United States were to ask it to do so. The days when Australia would be willing to be a “mate” to the United States in any and all issues seem over. Japan and the United States have been military allies since the end of World War II. Given Japan’s security needs vis-à-vis an increasingly assertive China and a belligerent North Korea, it retains a strong national interest in maintaining close security ties with Washington. On the economic front, Japan has very close ties with the United States, with a trade relationship valued at about $195.5 billion. However, similar to Australia, these ties are facing some strain. Japan had viewed the TPP as being instrumental to reviving its stagnant economy. As a consequence, Japanese Prime Minister Shinzo Abe took pains to overcome opposition from conservative nationalists to sign on to the trade agreement. The unilateral withdrawal by the Trump administration left Abe in a difficult position. As a consequence, Japan reluctantly took on a leadership role in renegotiating the TPP-11 agreement. Japan has also sought closer relations with China, working with it on the Belt and Road Initiative, supported the China-led Asian Infrastructure Investment Bank, and encouraged negotiations on RCEP. In addition, the EU-Japan free trade agreement, signed in July 2018, could reorient the Japanese economy away from the United States and toward the European Union. Japan is also seeking to deepen its ties with a number of other countries, including Australia, Singapore, Myanmar, and India. For both Japan and Australia, their security interests are still well served by its alliance with the United States. However, confronted with sustained instabilities in American foreign policy, they are also seeking out autonomous roles in the Asia-Pacific region. Vietnam’s relationship with the United States, marked by the Vietnam War and the Vietnamese government’s fiercely independent outlook, is unlike that of Japan and Australia. Yet, Vietnam shares the security and economic concerns of its Asian neighbors. First, as with Japan and Australia, China is a pressing and constant concern for Vietnam. Second, it, too, is seeking new market opportunities in Asia and beyond. Closer engagement with the United States would give Vietnam access to the lucrative American market and provide a balance to China. Among the original 12 TPP signatories, Vietnam had the lowest per capita GDP and, consequently, had arguably the most to gain from the agreement. Closer ties with the United States also offered a larger strategic benefit: the ability to be closer to the only country that can be a countervailing force to China. Yet, even after the U.S. withdrawal, Vietnam participated actively in the TPP-11 discussions and signed on to the agreement in March 2018. Recognizing the shifts in American priorities, the Vietnamese government believes that participation in multilateral economic agreements will protect the country’s interests, by growing its economy and reducing its dependence on China. While Washington remains mired in foreign policy flip-flops, Vietnam is pursuing a carefully crafted strategy, based on a clear understanding of its national security and economic interests. Vietnam remains cautiously interested in deepening its ties to the United States, while also participating in other multilateral and bilateral arrangements. Continuing inconsistencies in U.S. policy might well persuade Vietnam that its engagement efforts are better focused on China and other actors in the region. As long-standing allies, Australia and Japan have forged a durable relationship with the United States, based on shared values and interests. But the allies have good reason to fear that, in the decades to come, the United States will not be able to deliver the benefits that it used to. As a result, they have both, on their own initiative, sought out closer engagement with China and worked to strengthen multilateral regional arrangements. Vietnam’s history with the United States is dramatically different. Unlike Japan and Australia, it does not, and is not likely to, have a military alliance with Washington. However, like Japan and Australia, it has sought indications from the United States that it would be a credible counterfoil to growing Chinese power. In the absence of reliable and steady commitments to this effect, Vietnam, too, has been working to protect its national interests through partnership with other countries. To be blunt: other countries are not waiting for the United States to find a way out of its own problems. Rather, they are proactively rising up to the challenge of the times by forging their own, autonomous positions. Moving forward, the three countries surveyed stand to gain from continuing to develop a diversified strategic policy. It is in the interests of all three to seek greater engagement with the Chinese. At the same time, each country has ample reasons to be wary of Chinese influence and assertiveness. In most of its foreign interventions and bilateral initiatives, China has shown that its interests are parochial, designed to benefit China and China alone. While recipient countries may receive short-term benefits, such as access to China’s market or an infusion of development aid, China inevitably tilts the terms to benefit itself in the long term, both economically and politically. We have seen China use its economic relationship to influence political outcomes in many nations, including Australia. Countries that engage with China must be cautious and protect their own political and economic sovereignty. As such, Japan, Australia, and Vietnam should continue to build multilateral arrangements, something that has been sorely lacking in the Asia-Pacific region. Cooperation with other states is the best possible bulwark against both U.S. decline and Chinese aggression. The fact that all three countries negotiated and signed TPP-11 is an encouraging signal that they, and their partners, recognize the importance of continuing forward with multilateral institutions and agreements. Finally, we have the United States. In order to protect its position as a valuable trade and security partner, the United States should find ways to reassure Asian countries that it continues to be invested in the security, stability, and prosperity of the region. Such reassurances must include a demonstrated willingness to respect and accommodate its partners, old and new. Even after hegemony, a global order, based on multilateral cooperation, can yield shared benefits for all its members, including the United States. Anish Goel is a senior fellow at the New America Foundation.